"Traitor" redirects here. For the act itself, see Betrayal. For other uses, see Treason (disambiguation), High Treason (disambiguation), and Traitor (disambiguation). In law, treason is criminal disloyalty to the state. It is a crime that covers some of the more extreme acts against one's nation or sovereign. This usually includes things such as participating in a war against one's native country, attempting to overthrow its government, spying on its military, its diplomats, or its secret services for a hostile and foreign power, or attempting to kill its head of state. A person who commits treason is known in law as a traitor. Historically, in common law countries, treason also covered the murder of specific social superiors, such as the murder of a husband by his wife or that of a master by his servant. Treason against the king was known as high treason and treason against a lesser superior was petty treason. As jurisdictions around the world abolished petty treason, "treason" came to refer to what was historically known as high treason. At times, the term traitor has been used as a political epithet, regardless of any verifiable treasonable action. In a civil war or insurrection, the winners may deem the losers to be traitors. Likewise the term traitor is used in heated political discussion – typically as a slur against political dissidents, or against officials in power who are perceived as failing to act in the best interest of their constituents. 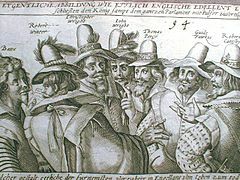 In certain cases, as with the Dolchstoßlegende (Stab-in-the-back myth), the accusation of treason towards a large group of people can be a unifying political message. Treason is considered to be different and on many occasions a separate charge from "treasonable felony" in many parts of the world. 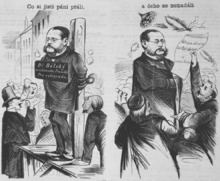 Cartoon depicting Václav Bělský (1818–1878), Mayor of Prague from 1863 until 1867, in charge of the city during Prussian occupation in July 1866. Some forces wanted to try him for high treason (left: "What some men wished" – "Dr. Bělský for high treason"), but he got a full confidence from the Council of Prague (right: "but what they did not expect" – "address of confidence from the city of Prague"). In English law, high treason was punishable by being hanged, drawn and quartered (men) or burnt at the stake (women), although beheading could be substituted by royal command (usually for royalty and nobility). Those penalties were abolished in 1814, 1790 and 1973 respectively. The penalty was used by later monarchs against people who could reasonably be called traitors. Many of them would now just be considered dissidents. The words "treason" and "traitor" are derived from the Latin tradere, to deliver or hand over. Christian theology and political thinking until after the Enlightenment considered treason and blasphemy as synonymous, as it challenged both the state and the will of God. Kings were considered chosen by God, and to betray one's country was to do the work of Satan. Many nations' laws mention various types of treason. "Crimes Related to Insurrection" is the internal treason, and may include a coup d'état. "Crimes Related to Foreign Aggression" is the treason of cooperating with foreign aggression positively regardless of the national inside and outside. "Crimes Related to inducement of Foreign Aggression" is the crime of communicating with aliens secretly to cause foreign aggression or menace. Depending on a country, conspiracy is added to these. In Australia, there are federal and state laws against treason, specifically in the states of New South Wales, South Australia and Victoria. Similarly to Treason laws in the United States, citizens of Australia owe allegiance to their sovereign, the federal and state level. (h) forms an intention to do any act referred to in a preceding paragraph and manifests that intention by an overt act. A person is not guilty of treason under paragraphs (e), (f) or (h) if their assistance or intended assistance is purely humanitarian in nature. The maximum penalty for treason is life imprisonment. Section 80.1AC of the Act creates the related offence of treachery. The Treason Act 1351, the Treason Act 1795 and the Treason Act 1817 form part of the law of New South Wales. The Treason Act 1795 and the Treason Act 1817 have been repealed by Section 11 of the Crimes Act 1900, except in so far as they relate to the compassing, imagining, inventing, devising, or intending death or destruction, or any bodily harm tending to death or destruction, maim, or wounding, imprisonment, or restraint of the person of the heirs and successors of King George III of the United Kingdom, and the expressing, uttering, or declaring of such compassings, imaginations, inventions, devices, or intentions, or any of them. Whosoever, within New South Wales or without, compasses, imagines, invents, devises, or intends to deprive or depose Our Most Gracious Lady the Queen, her heirs or successors, from the style, honour, or Royal name of the Imperial Crown of the United Kingdom, or of any other of Her Majesty's dominions and countries, or to levy war against Her Majesty, her heirs or successors, within any part of the United Kingdom, or any other of Her Majesty's dominions, in order, by force or constraint, to compel her or them to change her or their measures or counsels, or in order to put any force or constraint upon, or in order to intimidate or overawe, both Houses or either House of the Parliament of the United Kingdom, or the Parliament of New South Wales, or to move or stir any foreigner or stranger with force to invade the United Kingdom, or any other of Her Majesty's dominions, or countries under the obeisance of Her Majesty, her heirs or successors, and expresses, utters, or declares such compassings, imaginations, inventions, devices, or intentions, or any of them, by publishing any printing or writing, or by open and advised speaking, or by any overt act or deed, shall be liable to imprisonment for 25 years. Section 16 provides that nothing in Part 2 repeals or affects anything enacted by the Treason Act 1351 (25 Edw.3 c. 2). This section reproduces section 6 of the Treason Felony Act 1848. The offence of treason was created by section 9A(1) of the Crimes Act 1958. In South Australia, treason is defined under Section 7 of the South Australia Criminal Law Consolidation Act 1935 and punished under Section 10A. Any person convicted of treason against South Australia will receive a mandatory sentence of life imprisonment. According to Brazilian law, treason is the crime of disloyalty by a citizen to the Federal Republic of Brazil, applying to combatants of the Brazilian military forces. Treason during wartime is the only crime for which a person can be sentenced to death (see capital punishment in Brazil). The only military person in the history of Brazil to be convicted of treason was Carlos Lamarca, an army captain who deserted to become the leader of a communist-terrorist guerrilla against the military government. (e) conspires with any person to do anything mentioned in paragraph (b) or forms an intention to do anything mentioned in paragraph (b) and manifests that intention by an overt act. It is also illegal for a Canadian citizen or a person who owes allegiance to Her Majesty in right of Canada to do any of the above outside Canada. The penalty for high treason is life imprisonment. The penalty for treason is imprisonment up to a maximum of life, or up to 14 years for conduct under subsection (2)(b) or (e) in peacetime. Finnish law distinguishes between two types of treasonable offences: maanpetos, treachery in war, and valtiopetos, an attack against the constitutional order. The terms maanpetos and valtiopetos are unofficially translated as treason and high treason, respectively. Both are punishable by imprisonment, and if aggravated, by life imprisonment. Maanpetos consists in joining enemy armed forces, making war against Finland, or serving or collaborating with the enemy. Maanpetos proper can only be committed under conditions of war or the threat of war. Espionage, disclosure of a national secret, and certain other related offences are separately defined under the same rubric in the Finnish criminal code. Valtiopetos consists in using violence or the threat of violence, or unconstitutional means, to bring about the overthrow of the Finnish constitution or to overthrow the president, cabinet or parliament or to prevent them from performing their functions. The acts defined by articles 411-2 to 411–11 constitute treason where they are committed by a French national or a soldier in the service of France, and constitute espionage where they are committed by any other person. Article 411-2 prohibits "handing over troops belonging to the French armed forces, or all or part of the national territory, to a foreign power, to a foreign organisation or to an organisation under foreign control, or to their agents". It is punishable by life imprisonment and a fine of €750,000. Generally parole is not available until 18 years of a life sentence have elapsed. Articles 411-3 to 411–10 define various other crimes of collaboration with the enemy, sabotage, and the like. These are punishable with imprisonment for between seven and 30 years. Article 411-11 make it a crime to incite any of the above crimes. Besides treason and espionage, there are many other crimes dealing with national security, insurrection, terrorism and so on. These are all to be found in Book IV of the code. Section 2 of the Crime Ordinance provides that levying war against the HKSAR Government of the People's Republic of China, conspiring to do so, instigating a foreigner to invade Hong Kong, or assisting any public enemy at war with the HKSAR Government, is treason, punishable with life imprisonment. German law differentiates between two types of treason: "High treason" (Hochverrat) and "treason" (Landesverrat). High treason, as defined in Section 81 of the German criminal code is defined as a violent attempt against the existence or the constitutional order of the Federal Republic of Germany, carrying a penalty of life imprisonment or a fixed term of at least ten years. In less serious cases, the penalty is 1–10 years in prison. German criminal law also criminalises high treason against a German state. Preparation of either types of the crime is criminal and carries a penalty of up to five years. The other type of treason, Landesverrat is defined in Section 94. It is roughly equivalent to espionage; more precisely, it consists of betraying a secret either directly to a foreign power, or to anyone not allowed to know of it; in the latter case, treason is only committed if the aim of the crime was explicitly to damage the Federal Republic or to favor a foreign power. The crime carries a penalty of one to fifteen years in prison. However, in especially severe cases, life imprisonment or any term of at least of five years may be sentenced. As for many crimes with substantial threats of punishment active repentance is to be considered in mitigation under §83a StGB (Section 83a, Criminal Code). Notable cases involving Landesverrat are the Weltbühne trial during the Weimar Republic and the Spiegel scandal of 1962. On 30. July 2015, Germany's Public Prosecutor General Harald Range initiated criminal investigation proceedings against the German blog netzpolitik.org. treason shall consist only in levying war against the State, or assisting any State or person or inciting or conspiring with any person to levy war against the State, or attempting by force of arms or other violent means to overthrow the organs of government established by the Constitution, or taking part or being concerned in or inciting or conspiring with any person to make or to take part or be concerned in any such attempt. Following the enactment of the 1937 constitution, the Treason Act 1939 provided for the imposition of the death penalty for treason. The Criminal Justice Act 1990 abolished the death penalty, setting the punishment for treason at life imprisonment, with parole in not less than forty years. No person has been charged under the Treason Act. Irish republican legitimatists who refuse to recognise the legitimacy of the Republic of Ireland have been charged with lesser crimes under the Offences against the State Acts 1939–1998. The Czechoslovak legionnaires in Italy executed after being captured by the Austro-Hungarian forces. The Italian law defines various types of crimes that could be generally described as treason (tradimento), although they are so many and so precisely defined that no one of them is simply called tradimento in the text of Codice Penale (Italian Criminal Code). The treason-type crimes are grouped as "crimes against the personhood of the State" (Crimini contro la personalità dello Stato) in the Second Book, First Title, of the Criminal Code. Articles 241 to 274 detail crimes against the "international personhood of the State" such as "attempt against wholeness, independence and unity of the State" (art.241), "hostilities against a foreign State bringing the Italian State in danger of war" (art.244), "bribery of a citizen by a foreigner against the national interests" (art.246), and "political or military espionage" (art.257). Articles 276 to 292 detail crimes against the "domestic personhood of the State", ranging from "attempt on the President of the Republic" (art.271), "attempt with purposes of terrorism or of subversion" (art.280), "attempt against the Constitution" (art.283), "armed insurrection against the power of the State" (art.284), and "civil war" (art.286). Further articles detail other crimes, especially those of conspiracy, such as "political conspiracy through association" (art.305), or "armed association: creating and participating" (art.306). The penalties for treason-type crimes, before 1948, included death as maximum penalty, and, for some crimes, as the only penalty possible. Nowadays the maximum penalty is life imprisonment (ergastolo). Japan does not technically have a law of treason. Instead it has an offence against taking part in foreign aggression against the Japanese state (gaikan zai; literally "crime of foreign mischief"). The law applies equally to Japanese and non-Japanese people, while treason in other countries usually applies only to their own citizens. Technically there are two laws, one for the crime of inviting foreign mischief (Japan Criminal Code section 2 clause 81) and the other for supporting foreign mischief once a foreign force has invaded Japan. "Mischief" can be anything from invasion to espionage. Before World War II, Japan had a crime similar to the English crime of high treason (Taigyaku zai), which applied to anyone who harmed the Japanese emperor or imperial family. This law was abolished by the American Occupation force after World War II. The application of "Crimes Related to Insurrection" to the Aum Shinrikyo cult of religious terrorists was considered. (f) Conspires with any person to do anything mentioned in this section. The penalty is life imprisonment, except for conspiracy, for which the maximum sentence is 14 years' imprisonment. Treason was the last capital crime in New Zealand law, with the death penalty not being revoked until 1989, years after it was abolished for murder. Very few people have been prosecuted for the act of treason in New Zealand and none have been prosecuted in recent years. Article 85 of the Constitution of Norway states that "[a]ny person who obeys an order the purpose of which is to disturb the liberty and security of the Storting [Parliament] is thereby guilty of treason against the country." Article 275 of the Criminal Code of Russia defines treason as "espionage, disclosure of state secrets, or any other assistance rendered to a foreign State, a foreign organization, or their representatives in hostile activities to the detriment of the external security of the Russian Federation, committed by a citizen of the Russian Federation." The sentence is imprisonment for 12 to 20 years. It is not a capital offence, even though murder and some aggravated forms of attempted murder are (although Russia currently has a moratorium on the death penalty). Subsequent sections provide for further offences against state security, such as armed rebellion and forcible seizure of power. Sweden's treason laws have seen little application in modern times. The most recent case was in 2001. Four teenagers (their names were not reported) were convicted of treason after they assaulted King Carl XVI Gustaf with a strawberry cream cake on 6 September that year. They were fined between 80 and 100 days' income. – separating Swiss territory from the Confederation or territory from a canton, shall be punished with imprisonment of no less than a year. 1. Whoever makes known or accessible a secret, the preservation of which is required in the interest of the Confederation, to a foreign state or its agents, (...) shall be punished with imprisonment of no less than a year. 2. Whoever makes known or accessible a secret, the preservation of which is required in the interest of the Confederation, to the public, shall be punished with imprisonment of up to five years or a monetary penalty. 1 Whoever, with the purpose of inciting or supporting foreign enterprises aimed against the security of Switzerland, enters into contact with a foreign state or with foreign parties or other foreign organizations or their agents, or makes or disseminates untrue or tendentious claims (unwahre oder entstellende Behauptungen / informations inexactes ou tendancieuses), shall be punished with imprisonment of up to five years or a monetary penalty. 2 In grave cases the judge may pronounce a sentence of imprisonment of no less than a year. The criminal code also prohibits, among other acts, the suppression or falsification of legal documents or evidence relevant to the international relations of Switzerland (art. 267, imprisonment of no less than a year) and attacks against the independence of Switzerland and incitement of a war against Switzerland (art. 266, up to life imprisonment). The Swiss military criminal code contains additional prohibitions under the general title of "treason", which also apply to civilians, or which in times of war civilians are also (or may by executive decision be made) subject to. These include espionage or transmission of secrets to a foreign power (art. 86); sabotage (art. 86a); "military treason", i.e., the disruption of activities of military significance (art. 87); acting as a franc-tireur (art. 88); disruption of military action by disseminating untrue information (art. 89); military service against Switzerland by Swiss nationals (art. 90); or giving aid to the enemy (art. 91). The penalties for these crimes vary, but include life imprisonment in some cases. Treason per se is not defined in the Turkish Penal Code. However, the law defines crimes which are traditionally included in the scope of treason, such as cooperating with the enemy during wartime. Treason is punishable by imprisonment up to life. The British law of treason is entirely statutory and has been so since the Treason Act 1351 (25 Edw. 3 St. 5 c. 2). The Act is written in Norman French, but is more commonly cited in its English translation. "if a man slea the chancellor, treasurer, or the King's justices of the one bench or the other, justices in eyre, or justices of assise, and all other justices assigned to hear and determine, being in their places, doing their offices". "if any person or persons ... shall endeavour to deprive or hinder any person who shall be the next in succession to the crown ... from succeeding after the decease of her Majesty (whom God long preserve) to the imperial crown of this realm and the dominions and territories thereunto belonging". By virtue of the Treason Act 1708, the law of treason in Scotland is the same as the law in England, save that in Scotland the slaying of the Lords of Session and Lords of Justiciary and counterfeiting the Great Seal of Scotland remain treason under sections 11 and 12 of the Treason Act 1708 respectively. Treason is a reserved matter about which the Scottish Parliament is prohibited from legislating. Two acts of the former Parliament of Ireland passed in 1537 and 1542 create further treasons which apply in Northern Ireland. The penalty for treason was changed from death to a maximum of imprisonment for life in 1998 under the Crime And Disorder Act. Before 1998, the death penalty was mandatory, subject to the royal prerogative of mercy. Since the abolition of the death penalty for murder in 1965 an execution for treason was unlikely to have been carried out. As to who can commit treason, it depends on the ancient notion of allegiance. As such, all British nationals (but not other Commonwealth citizens) owe allegiance to the Queen in right of the United Kingdom wherever they may be, as do Commonwealth citizens and aliens present in the United Kingdom at the time of the treasonable act (except diplomats and foreign invading forces), those who hold a British passport however obtained, and aliens who – having lived in Britain and gone abroad again – have left behind family and belongings. The Treason Act 1695 enacted, among other things, a rule that treason could be proved only in a trial by the evidence of two witnesses to the same offence. Nearly one hundred years later this rule was incorporated into the U.S. Constitution, which requires two witnesses to the same overt act. It also provided for a three-year time limit on bringing prosecutions for treason (except for assassinating the king), another rule which has been imitated in some common law countries. The Sedition Act 1661 made it treason to imprison, restrain or wound the king. Although this law was abolished in the United Kingdom in 1998, it still continues to apply in some Commonwealth countries. In the 1790s, opposition political parties were new and not fully accepted. Government leaders often considered their opponents to be traitors. Historian Ron Chernow reports that Secretary of the Treasury Alexander Hamilton and President George Washington "regarded much of the criticism fired at their administration as disloyal, even treasonous, in nature." When an undeclared Quasi-War broke out with France in 1797–98, "Hamilton increasingly mistook dissent for treason and engaged in hyperbole." Furthermore, the Jeffersonian opposition party behaved the same way. After 1801, with a peaceful transition in the political party in power, the rhetoric of "treason" against political opponents diminished. Iva Toguri, known as Tokyo Rose, was tried for treason after World War II for her broadcasts to American troops. However, Congress has passed laws creating related offenses that punish conduct that undermines the government or the national security, such as sedition in the 1798 Alien and Sedition Acts, or espionage and sedition in the Espionage Act of 1917, which do not require the testimony of two witnesses and have a much broader definition than Article Three treason. Some of these laws are still in effect. Some well-known spies, such as Julius and Ethel Rosenberg, have been convicted of espionage rather than treason. In the United States, Benedict Arnold's name is considered synonymous with treason due to his collaboration with the British during the American Revolutionary War. This, however, occurred before the Constitution was written. Arnold became a general in the British Army, which protected him. Since the Constitution came into effect, there have been fewer than 40 federal prosecutions for treason and even fewer convictions. Several men were convicted of treason in connection with the 1794 Whiskey Rebellion but were pardoned by President George Washington. The most famous treason trial, that of Aaron Burr in 1807, resulted in acquittal. In 1807, on a charge of treason, Burr was brought to trial before the United States Circuit Court at Richmond, Virginia. The only physical evidence presented to the grand jury was Wilkinson's so-called letter from Burr, which proposed the idea of stealing land in the Louisiana Purchase. The trial was presided over by Chief Justice of the United States John Marshall, acting as a circuit judge. Since no witnesses testified, Burr was acquitted in spite of the full force of Jefferson's political influence thrown against him. Immediately afterward, Burr was tried on a misdemeanor charge and was again acquitted. During the American Civil War, treason trials were held in Indianapolis against Copperheads for conspiring with the Confederacy against the United States. After the war the question was whether the United States government would make indictments for treason against leaders of the Confederate States of America, as many people demanded. Jefferson Davis, the Confederate president, was indicted and held in prison for two years. The indictment was dropped in 1869 when the political scene had changed and it was possible he would be acquitted by a jury in Virginia. When accepting Lee's surrender of the Army of Northern Virginia, at Appomattox, in April 1865, Gen. Ulysses S. Grant assured all Confederate soldiers and officers a blanket amnesty, provided they returned to their homes and refrained from any further acts of hostility, and subsequently other Union generals issued similar terms of amnesty when accepting Confederate surrenders. All Confederate officials received a blanket amnesty issued by President Andrew Johnson as he left office in 1869. In 1949 Iva Toguri D'Aquino was convicted of treason for wartime radio broadcasts (under the name of "Tokyo Rose") and sentenced to ten years, of which she served six. As a result of prosecution witnesses having lied under oath, she was pardoned in 1977. In 1952 Tomoya Kawakita, a Japanese-American dual citizen was convicted of treason and sentenced to death for having worked as an interpreter at a Japanese POW camp and having mistreated American prisoners. He was recognized by a former prisoner at a department store in 1946 after having returned to the United States. The sentence was later commuted to life imprisonment and a $10,000 fine. He was released and deported in 1963. The Cold War saw frequent talk linking treason with support for Communist-led causes. The most memorable of these came from Senator Joseph McCarthy, who used rhetoric about the Democrats as guilty of "twenty years of treason". As chosen chair of the Senate Permanent Investigations Subcommittee, McCarthy also investigated various government agencies for Soviet spy rings (see the Venona project); however, he acted as a political fact-finder rather than a criminal prosecutor. The Cold War period saw no prosecutions for explicit treason, but there were convictions and even executions for conspiracy to commit espionage on behalf of the Soviet Union, such as in the Julius and Ethel Rosenberg case. On October 11, 2006, the United States government charged Adam Yahiye Gadahn for videos in which he appeared as a spokesman for al-Qaeda and threatened attacks on American soil. He was killed on January 19, 2015 in an unmanned aircraft (drone) strike in Waziristan, Pakistan. Most states have treason provisions in their constitutions or statutes similar to those in the U.S. Constitution. The Extradition Clause specifically defines treason as an extraditable offense. Thomas Jefferson in 1791 said that any Virginia official who cooperated with the federal Bank of the United States proposed by Alexander Hamilton was guilty of "treason" against the state of Virginia and should be executed. The Bank opened and no one was prosecuted. Several persons have been prosecuted for treason on the state level. Thomas Dorr was convicted for treason against the state of Rhode Island for his part in the Dorr Rebellion, but was eventually granted amnesty. John Brown was convicted of treason against the Commonwealth of Virginia for his part in the raid on Harpers Ferry, and was hanged. The Mormon prophet, Joseph Smith, was charged with treason against Missouri along with five others, at first in front of a state military court, but Smith was allowed to escape to Illinois after his case was transferred to a civilian court for trial on charges of treason and other crimes. Smith was then later imprisoned for trial on charges of treason against Illinois, but was murdered by a lynch mob while in jail awaiting trial. 1. Any Vietnamese citizen acting in collusion with a foreign country with a view to causing harm to the independence, sovereignty, unity and territorial integrity of the Fatherland, the national defense forces, the socialist regime or the State of the Socialist Republic of Vietnam shall be sentenced to between twelve and twenty years of imprisonment, life imprisonment or capital punishment. 2. In the event of many extenuating circumstances, the offenders shall be subject to between seven and fifteen years of imprisonment. Also, according to the Law on Amnesty amended in November 2018, it is impossible for those convicted for treason to be granted amnesty. Early in Islamic history, the only form of treason was seen as the attempt to overthrow a just government or waging war against the State. According to Islamic tradition, the prescribed punishment ranged from imprisonment to the severing of limbs and the death penalty depending on the severity of the crime. However, even in cases of treason the repentance of a person would have to be taken into account. Currently, the consensus among major Islamic schools is that apostasy (leaving Islam) is considered treason and that the penalty is death; this is supported not in the Quran but in hadith. This confusion between apostasy and treason almost certainly had its roots in the Ridda Wars, in which an army of rebel traitors led by the self-proclaimed prophet Musaylima attempted to destroy the caliphate of Abu Bakr. In the 19th and early 20th century, the Iranian Cleric Sheikh Fazlollah Noori opposed the Iranian Constitutional Revolution by inciting insurrection against them through issuing fatwas and publishing pamphlets arguing that democracy would bring vice to the country. The new government executed him for treason in 1909. In Malaysia, it is treason to commit offences against the Yang di-Pertuan Agong's person, or to wage or attempt to wage war or abet the waging of war against the Yang di-Pertuan Agong, a Ruler or Yang di-Pertua Negeri. All these offences are punishable by hanging, which derives from the English treason acts (as a former British colony, Malaysia's legal system is based on English common law). If there is serious evidence that a person has perpetrated acts, delivered statements, exercised activities, or has been involved in contacts inside or outside the country, which are of a nature considered to be in violation of the internal or external security of the country, the religious and national interests of the State, its social or economic system; or considered to be an act of sedition that affects or can possibly affect the existing relations between the people and Government, between the various institutions of the State, between the classes of the people, or between those who work in corporations propagating subversive propaganda or disseminating atheistic principles; the Minister of Interior may order the arrest of that person, committing him to one of Bahrain's prisons, searching him, his residence and the place of his work, and may take any measure which he deems necessary for gathering evidence and completing investigations. The period of detention may not exceed three years. Searches may only be made and the measures provided for in the first paragraph may only be taken upon judicial writ. In the areas controlled by the Palestinian National Authority, it is treason to give assistance to Israeli troops without the authorization of the Palestinian Authority or to sell land to Jews (irrespective of nationality) and also non-Jewish Israeli citizens under the Palestinian Land Laws, as part of the PA's general policy of discouraging the expansion of Israeli settlements. Both crimes are capital offences subject to the death penalty, although the former provision has not often been enforced since the beginning of effective security cooperation between the Israel Defense Forces, Israel Police, and Palestinian National Security Forces since the mid-2000s (decade) under the leadership of Prime Minister Salam Fayyad. Likewise, in the Gaza Strip under the Hamas-led government, any sort of cooperation or assistance to Israeli forces during military actions is also punishable by death. Apostasy in Islam is considered treason in Islamic belief. Compounding treason is dropping a prosecution for treason in exchange for money or money's worth. Defection, or leaving the country, is regarded in some communist countries (especially during the Cold War) as disloyal to the state. Lèse majesté is insulting a head of state and is a crime in some countries. Misprision of treason is a crime consisting of the concealment of treason. Treachery, the name of a number of derivative offences. Treason felony, a British offence tantamount to treason. Different cultures have evolved a variety of terms for "traitor" or collaborator, often based on historical incidences of treason to that culture or of people whose name has become a byword for treason. ^ "Traitor | Definition of Traitor by Merriam-Webster"
^ Gunn, Giles (2017). "Puritan Ascendance and Decline". The Pragmatist Turn: Religion, the Englightenment, and the Formation of American Literature. University of Virginia Press. ^ Oxford English Dictionary, online as of April 2, 2019; entries "treason" and "traitor". ^ Cf. parallels in Eastern and Oriental cultures, such as the Divine mandate and Mandate of Heaven. ^ "Criminal Code Act 1995 – Schedule The Criminal Code". Commonwealth Consolidated Acts. Australasian Legal Information Institute. Retrieved 17 November 2012. ^ "Crimes Act 1900 – Section 11". New South Wales Consolidated Acts. Australasian Legal Information Institute. Retrieved 17 November 2012. ^ "Crimes Act 1900 – Section 12". New South Wales Consolidated Acts. Australasian Legal Information Institute. Retrieved 17 November 2012. ^ "Crimes Act 1900 – Section 16". New South Wales Consolidated Acts. Australasian Legal Information Institute. Retrieved 17 November 2012. ^ "Crimes Act 1958 – Section 9A". Victorian Consolidated Acts. Australasian Legal Information Institute. Retrieved 17 November 2012. ^ "Treason and other Offences against the Queen's Authority and Person". Government of Canada. Retrieved 27 September 2017. ^ Gold, Samantha (February 28, 2017). "Treason: A Crash Course on the Gravest National Crime". Forget the Box Media. Retrieved January 28, 2019. A conviction for high treason carries the penalty of life in prison. ^ "200-2: Treason". Hong Kong Crimes Ordinance. Retrieved 17 November 2012. ^ "A601-6: Schedule added". Hong Kong Crimes Ordinance. Retrieved 17 November 2012. ^ "High Treason". Criminal Code. The Comparative Law Society. Retrieved 17 November 2012. ^ "Treason And Endangering External Security". Criminal Code. The Comparative Law Society. Retrieved 17 November 2012. ^ "Constitution of Ireland". Department of the Taoiseach. Retrieved 17 November 2012. ^ "Treason Act, 1939". Irish Statute Book. Government of Ireland. Retrieved 17 November 2012. ^ "Criminal Justice Act, 1990". Irish Statute Book. Retrieved 17 November 2012. ^ "Penal Code (Act No. 45 of 1907)" (PDF). Penal Code of Japan: 1–5. June 12, 2007. ^ Palmowski, Jan (2016). A Dictionary of Contemporary World History. Oxford University Press. ISBN 9780199295678. ^ "Crimes against public order: Treason and other crimes against the Queen and the State". Crimes Act 1961. New Zealand Government. Retrieved 17 November 2012. ^ "Part D – Specific Oaths". Review of Oaths and Affirmations. New Zealand Ministry of Justice. May 2004. Retrieved 17 November 2012. ^ "Chapter 29. Crimes Against the Fundamentals of the Constitutional System and State Security". The Criminal Code Of The Russian Federation. Open LLC. Retrieved 17 November 2012. ^ "Swedish Tart Attack was Treason". CNN. December 3, 2001. ^ As was widely pointed out in the press at the time, if the allegations that James Hewitt had an affair with Princess Diana whilst she was married to Prince Charles had been substantiated, it would have amounted to the crime of treason. Queens consort Anne Boleyn, Catherine Howard and Caroline of Brunswick were prosecuted for treasonable adultery. ^ Ipsen, Erik (5 October 1994). "'Kiss and Tell' Officer Draws Heaps of Scorn". The New York Times. Retrieved 17 November 2012. ^ "Treason Act 1708". Legislation.gov.uk. Crown. Retrieved 17 November 2012. ^ "Crime and Disorder Act 1998". Legislation.gov.uk. Crown. Retrieved 17 November 2012. ^ Gani, Aisha (2014-10-17). "Treason Act: the facts". The Guardian. ISSN 0261-3077. Retrieved 2019-04-03. ^ Ron Chernow (2005). Alexander Hamilton. Penguin Books. p. 392. ^ Chernow (2005). Alexander Hamilton. p. 569. ^ Richard Hofstadter (1969). The Idea of a Party System: The Rise of Legitimate Opposition in the United States, 1780–1840. University of California Press. p. 141. ^ William Rehnquist, "Civil Liberty and the Civil War: The Indianapolis Treason Trials," Indiana Law Journal 72 (Fall 1997), 932+. online The author was Chief Justice of the United States. ^ https://www.aleksandreia.com/2009/09/16/grant-lee-parole-treason/ . Notwithstanding this, some Northern leaders still tried to indict various Confederate leaders for treason, and Grant reminded President Johnson of the terms of surrender. ^ "US indicts fugitive for treason". The Herald Sun. 13 October 2006. Retrieved 17 November 2012. ^ White House Press Secretary (April 23, 2015). "Statement by the Press Secretary". White House Office of the Press Secretary. Retrieved February 29, 2016. ^ Ron Chernow (2005). Alexander Hamilton. Penguin Books. p. 352. ^ Walker, Jeff. “A Change of Venue: Joseph Smith's Escape from Liberty Jail.” Fairmormon.org, 2 Aug. 2007, www.fairmormon.org/wp-content/uploads/2011/11/2007-Jeffrey-Walker.pdf. ^ Fawn M. Brodie, No Man Knows My History (1945, reprinted 1995, NY, Vintage Books) chap. 17, page 255. ^ Tội phản bội tổ quốc được quy định thế nào? ^ "Chapter 5 Al-Ma'idah". Al Islam. Ahmadiyya Muslim Community. Retrieved 17 November 2012. ^ Cooney, Daniel (19 March 2006). "Christian convert faces death penalty in Afghanistan". The Guardian. Retrieved 17 November 2012. ^ Hull, Liz; Daniel Bates (7 December 2007). "Imam's daughter in hiding after her conversion to Christianity sparked death threats". Daily Mail. Retrieved 17 November 2012. ^ "Clerics Call for Christian Convert's Death Despite Western Outrage". Fox News.com. FOX News Network, LLC. 23 March 2006. Retrieved 17 November 2012. ^ Samir, Samir Khalil (29 August 2007). "Hegazi case: Islam's obsession with conversions". AsiaNews.it. AsiaNews C.F. Retrieved 17 November 2012. ^ Bostom, Andrew G. (27 March 2006). "Death for Apostasy". FrontPage Magazine. Retrieved 17 November 2012. Look up traitor in Wiktionary, the free dictionary.